Ramblings from an Over-Squozen Brain: Crawfish taste better when you catch them yourself! Crawfish taste better when you catch them yourself! 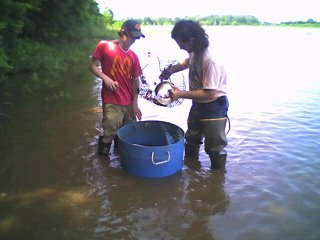 Here's a photo of a recent outing ... that's my brother André and his son Justin emptying a crawfish trap at a friend's crawfish pond a couple of weeks ago. (Thanks Brian!) We all gathered for an afternoon of crawfishing and regular fishing. After working the traps we went over to the stocked pond to let the kids catch some bream, bass and catfish while we boiled the 80 or so pounds of crawfish we had "harvested". They were succulent!!! I don't know if it was us gathering them or what but they tasted even more delicious than usual. Today we were talking about the different phases we go through. A little while back it was paintball ... what a blast! Now I'm into motorcycles and golf. It's interesting how people get involved in hobbies and throw themselves into them wholeheartedly. And then try to convert others to their hobby. (Thanks, but no thanks on going back to the gym! ) Some people eat, breathe and live deer hunting. For others it's quilting, or fishing, or knitting, or genealogy, or _________ (fill in the blank). None of the hobbies are bad, as long as we don't become obsessed with them. Dood! You have a blog?!? This is Faith. I just found this site and so I thoguth I would leave a comment. Luv ya! I just this site often to see if you've posted anything new. It was a great surprise to see that you finally did! LOL! Great to hear from you on my blog, Shana! I know I don't update often enough ... but like the old saying goes, "I try!" [GRIN] Hope you're having a great week. See you Thursday! It can be difficult to summon the passion for anything equal to my passion for crawfish (although my true passion is eating them)! I understand your dilemma. Sorry about the misunderstanding on my blog. After leaving Blogger, the comments are less regulated and I never know who's stopping by! Excellent post bro Nathan! Lol! Faith just barely found your blog? that's funny! Anyway, I really enjoyed this and am going to redirect some of that ferver back into the ministry that God and you all have entrusted me with, while it is an honor and a blast to go golfing, it is very much more an honor and a blast to worship with the Church family that has accepted me as their own. So uh...when do you wanna hit the links again?